Is warp travel theoretically possible? Will mankind ever be able to boldly go where no man has been before? Travelling to the far flung reaches of the galaxy has always been the dream of every science fiction fan and for years, it has been the mainstay of many an incarnation of Star Trek. With our current technology, though, travelling any further than the moon has, to date, been only a dream. In Star Trek, various captains and crew seem to travel effortlessly across unimaginable distances and bump into aliens as regularly as you or I would bump into old mates down the pub, but will that ever become a reality? Travelling faster than light is impossible, isn’t it? To put things into perspective, the nearest group of stars to the Earth, other than the sun, is Alpha Centauri and that is 4.37 light-years from Earth and, a light year is equal to 5,878,499,810,000 miles. You can do the maths if you wish, but that means that we won’t be travelling anywhere near other stars, until we can crack how to travel at speeds that are faster than the speed of light. The problem is though, that according to what we understand of the universe today and that includes Einstein’s Special Theory of Relatively, it is impossible for matter to travel faster than the speed of light. The reason for that is that matter itself is made out of atoms and molecules that are connected by electromagnetic fields, and that’s the same stuff that light is made up of. Matter, therefore, cannot go faster than what is holding it together. 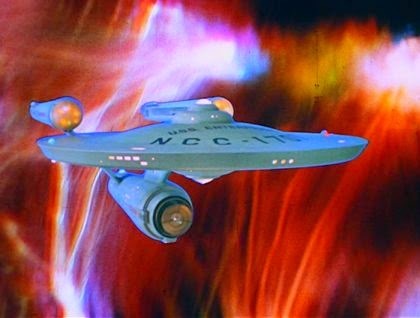 It turns out that Captain Kirk and his, five years flitting around the cosmos mission, might not be as much of an impossible dream as you might think, and you might be surprised to learn that NASA is even spending money on researching the possibility of interstellar warp drive technology. A NASA scientist, Harold White, and his team are working on a faster-than-light warp drive that could take astronauts to Alpha Centauri in a matter of weeks. This is not the blog to go into the mathematics of warp drives, but suffice to say, that White’s work is based upon an original concept by the Mexican theoretical physicist, Miguel Alcubierre, who published a paper in 1994 called "The Warp Drive: Hyper-Fast Travel Within General Relativity," which showed that space and time could, theoretically, be warped in front of and behind a spaceship. In other words, the speed of light does not need to be exceeded, because the distances can be shortened. What’s more, none of his theory contradicted Einstein’s Special Theory of Relatively. It would seem then, that warp travel is far more than just a dream, and NASA even recently released images of a design for a potential future interstellar starship, called the IXS Enterprise. This research isn’t just a fantasy, NASA and similar agencies are working on plans to send spacecraft beyond our own solar system in a hundred years’ time. Exciting times ahead, then, for future generations, but in the meantime, we’ll just have to make do with re-runs if Star Trek and our imagination.